If you've got the means, it'll provide the screams. While power-crazed, homebuilt machines may be enough for most people, the millionaires of the world surely prefer top of the line equipment. 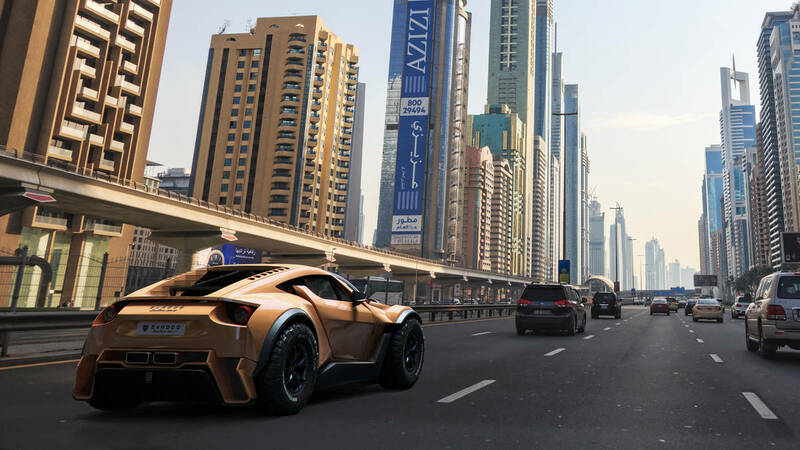 The Zarooq Sandracer 5000GT is the answer to the wealthy thrill seekers, and with Dakar-inspired engineering tied into stellar American V-8 power, it's sure to put others to shame while prancing through the desert. If you're looking for a high dollar Baja brute, look no further than this armor-clad buggy. The Zarooq was born in Dubai (where else?). By taking bits and pieces from successful racers, the Sandracer 5000GT is built right with everything in place—like the engine. The General Motor-sourced 6.2L V-8 is taken out of the Corvette, then tweaked to bring output up to 525 horsepower and 487-pound feet of torque. It's mounted in the middle, behind the driver, and provides the right amount of balance to sling the truck around the sand with its rear wheels putting power to the ground. A motorsport-derived, five-speed Weddle sequential gearbox gives just the right feel, to boot. The underpinnings of the Zarooq are what make the truck, though. Specially built Intrax dampers allow seemingly unlimited amounts of suspension travel, 45 centimeters total. A spaceframe chassis allows for ultimate rigidity, an especially important factor when you're beating the near half-million dollar hauler through whatever terrain you throw at it. Campos Racing designed a built-in roll cage to support matters as well. With the carbon fiber body attached, it only weighs 2,646 pounds. That's just enough to land you back on the ground once you've taken flight, something that the 5000 GT is particularly skilled at. If you want one of the 35 being built, you'll have to fork over a fair bit of change. Dependent on special requests, the price can go anywhere north of $435,000—which is only a little bit more than a used Dakar truck.